“No names are being released at this time. Please appreciate this is a difficult time for their families and our colleagues,” Fredericton police said on Twitter. A suspect is in custody, and the crime scene has been “contained,” police said. They said the investigation is ongoing and the suspect is being treated for serious injuries. Police later said there was “no further threat to the public” and no need for any lockdowns. “Our thoughts and prayers are now with the families, friends and colleagues of the two brave Police officers who gave their lives in order to protect and serve and with the families of the other two victims of this senseless act of violence,” said a tweet from the city of Fredericton on behalf of Mayor Mike O’Brien, the City Council and other municipal employees. The shooting occurred around 7 a.m. (6 a.m. ET) in the Brookside Drive area of the city of about 60,000 people, police said. “We extend our sincerest condolences to Chief Leanne Fitch, the officers of the Fredericton Police Force, and everyone affected by today’s events,” the city said in its tweet. 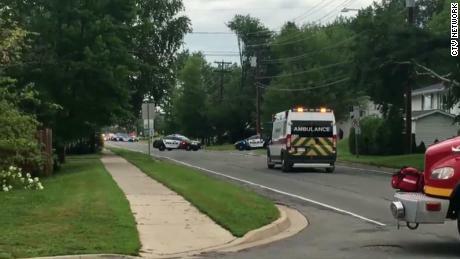 CNN network partner CTV said its reporter there said “police appeared to be focused on one particular residence” and that he heard four shots during a five-minute stretch. CTV said Moore reported that “police escorted people from their homes” after announcing a suspect was in custody. “I offer my condolences, thoughts and prayers to the victims and their families. During this difficult time, our thoughts are also with the courageous women and men on the front lines working to keep us safe,” he said. Canadian Prime Minister Justin Trudeau offered his condolences to those affected by the shooting and praised the actions of first responders. “We will not forget the two fallen police officers whose sacrifice no doubt saved lives and prevent even greater tragedy,” it said, adding the Royal Canadian Mounted Police was ready to assist Fredericton police, which is leading the investigation. Many facts surrounding the incident remain unknown, and the investigation is in its early stages, said Ralph Goodale, Canada’s minister of public safety and emergency preparedness. “What we do know is that four Canadians are dead, and that is a huge tragedy for the whole country, and all Canadians I’m sure would want to extend their condolences and their sympathies to the families and to all those who suffered in this incredible loss, including two police officers,” he told reporters. New Brunswick is one of Canada’s eastern Maritime provinces. Growing gun violence in recent years has been an issue in Toronto, Canada’s most populous city. CNN’s Paula Newton contributed to this report.